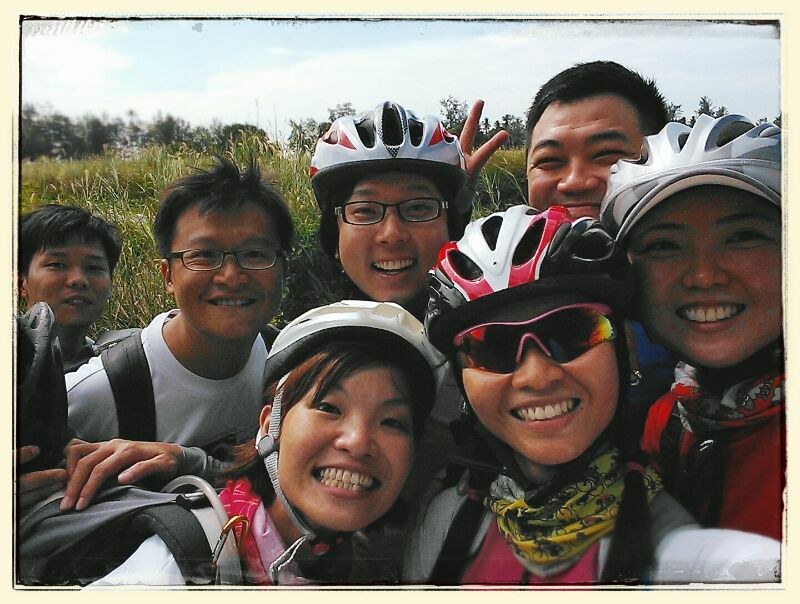 6 years ago, we did our first overseas cycling trip to a small village in Malaysia – Sungei Rengit. Back then, we rented bikes from a bike shop at Changi Village, booked a bum boat, set off to Pengarang and started cycling. I remember it was a hard ride under the hot sun and it seemed to take forever to reach our destination. 6 years later, making use of the long weekend holiday, we decided to do it again and this time shall go further and cycle up to Desaru! At 5:30am, as I was preparing to leave home, it started to rain, raining real heavily. Arrgh.. what a good timing! How to cycle in this weather? Well, we still have to proceed since we’ve already booked a 2 nights stay at the resort. We all reached Changi Point Ferry Terminal at around 7:00am. We met the bum boat uncle and he managed to help us find another 5 pax to fill up the boat. So we need only pay $13 each. By the time the boat set off for Tanjong Pengelih Ferry Terminal, the rain slow to a drizzle and 1 hour later we reached Pengarang. 2 road bikes, 2 foldies, 2 mountain bikes, 1 hybrid, we started our ride at 9:25am. It was still drizzling but made for a great cooling ride! Not much traffic and the terrain flat. 1 hour later, we reach Sungei Rengit… for .. lunch…. The key draw in Sungei Rengit is the seafood and lobster is a must eat here. We decided to have our first meal at Jade Garden Seafood Corner. We ordered golden pomfret HK style, Hor Fun, herbal chicken, butter milk lobsters and vege.. and the damage — MYR430!! Gosh! Not cheap at all and the lobsters don’t really taste fantastic! 12:12pm. Time to continue our journey to Desaru. Once we were out of Sungei Rengit, there’s actually a split road. One way is leading to the Ostrich farm, another with a big signage pointing to Pulai Beach Resort 33km. Not sure who suggested that it should be the way where it’s pointing to Pulai Beach Resort which later we checked google map, it’s highway # 92. What a mistake! We started our ride on highway # 92. There was this big question mark in our head. Yes, we knew that the terrain is hilly on the way to Desaru.. but a bit too much thou.. it even went up to a high 59m. It was demoralising whenever I see yet another hill to ride up… sigh. Next, why were there so many cars and they were all travelling very fast. The nicer ones kept a distance from us leaving a good gap between our bike and their car but some were really big bully! It was a stressful and tiring ride for me. Well, cheers to us.. after riding for 2 hrs 28 mins we finally reach Lotus Desaru Beach Resort! Hurray! Rest & relax at the beach, pool.. celebrating National Day..
Time to head home, it was a hot day with clear blue sky, unlike the day we came. We checked google map beforehand and went on the right route — highway # 90. Yes, this is the correct one. Terrain is flat with the occasional slopes, not much traffic andt so much more scenic and enjoyable ride. By the time we reach Sungei Rengit we were all ready for lunch. This round we check out at Good Luck Restaurant. We ordered butter and oats lobsters (ultra mini), red emperor fish, wild boar meat and vege. MYR300. Riding right after lunch under hot sun requires much determination. It took me slightly longer than the first day to complete the 17.30km from Sungei Rengit to the ferry terminal. Nevertheless, I am so happy when I finally reach the terminal. We were lucky, a bum boat with only 5 pax was already waiting and we were just in time to fill the boat. It was an enjoyable cycling trip with really fun and trusty kakis. Cheers, to more adventures my dear friends!